Wels, it is part of the original intention of this tread, thanks. The last pic of the church looks a lot like the church in Belvedere near Knysna. That is the famous 'Spookhuis'. I used to go to the Kenilworth Scout Camp at Hermanus when I was a young teenager & that was one of the places we sailed to in old klinker built lifeboats. My wife is a member of the Vernacular Architecture Society & this month's outing is to Stanford including going to the Spookhuis. It has been restored & the architect in charge will be talking to us. I have just bought her a F650GS & this is going to be our first weekend trip on our bikes. Will post pictures of it now that it has been restored. LS, you have a good eye for photography. Some stunning pics there. They remind me of a SA production many years back that was filmed in the area 'The Mantis Project". Marius Roberts, Sandra Prinsloo, etc. I do building plans for a living and these pics really are nice. Here's one I took in Wunsiedel in Germany while on vacation this past December. The big doors at the bottom of these buildings are where the people use to keep their horses and carts. Now they have been converted to extra living space. As an aside, have anyone ever wondered why a city like Pretoria has four lane one - way streets, when the streets were built long before cars got there. Just how exactly did they know they would be needing streets broad enough for four lanes of traffic? The answer is they didn't. The streets were just wide enough to turn a team of oxen around a corner, or for two teams to pass each other. Hau! Dats a BEEG piktcha boss! How the hell did THAT happen? Must have done the resizing wrong. 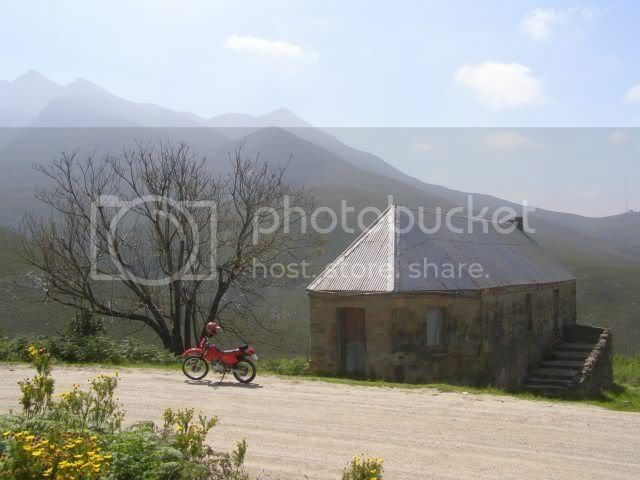 Were on a trip from the Olifants River to the Drakensberg and Geluksburg, took these pics. Bulwer in the Natal midlands. The only church in SA built completely out of yellow wood. Built in 1885, it is the oldest working church in SA from what I understand. And if you wonder about all the bikes............ It was Our wedding. Really cool to see all the different places people have been. Some pics from Namibia. What's the name of the Castle? . . . . Lager or Light? we drink ze beer wie ze "REINHEITSGEBOT" - spelled WINDHOEK!!! Hey Marlene, good humour!!!!! Since I was on the bike, I'll make it a light. How's that for a good boy? Check out the pic for the "real" info. Page created in 0.747 seconds with 26 queries.